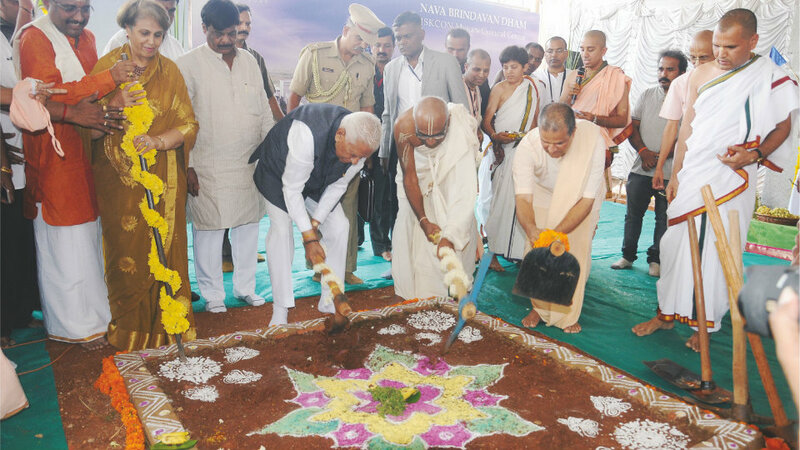 Karnataka Governor Vajubhai Rudabhai Vala laid the foundation stone for the Nava Brindavan Dham, ISKCON Mysuru Cultural Centre at the International Society for Krishna Consciousness (ISKCON) premises at Jayanagar in city this morning. 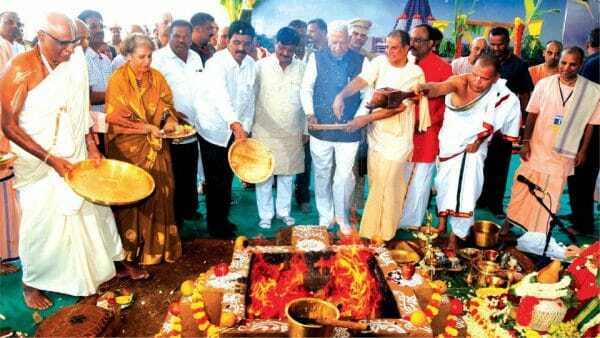 The temple complex and cultural centre will be built at a cost of Rs. 150 crore and its architecture would be on the lines of Hoysala style of temples. Designed in neo-classical style, the 60-meter tall structure of the temple will integrate the old age charm of Hoysala architecture and ultra-modern hi-tech architectural forms. Set to become a major tourist attraction in Mysuru, the entire structure will be an eco-friendly building with zero-waste tolerance, earthquake proof and rainwater harvesting facilities. The tower will have modern glass panes and there will be a vast ‘Kalyani’ or the divine pond that will be built for boat festivals of the temple. Deities of Radha Krishna, Krishna Balarama, Nitai Gauranga, Laxmi Narasimha and Ranganatha will be installed at the temple complex. Spacious garden and other amenities will provide a beautiful landscape. Addressing the gathering, Governor Vajubhai Rudabhai Vala said that the Nava Brindavan Dham will increase the pride of Mysuru. 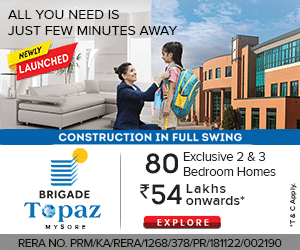 “It will be another jewel in Mysuru’s crown,” he said. Continuing, the Governor said that in India, there is a constant conflict between intellectuals and spiritualists. “There is a fight for supremacy between people who believe in intelligence and people who believe in spiritual and the divine. One must remember that an individual can get peace only if he is spiritually inclined,” he opined. “Greed for money is increasing in our society and ISKCON volunteers and heads have set an example by renouncing their wealth and families for the cause of the society,” the Governor said and added that he was a life-time member of ISKCON. ISKCON Society President and Chairman of Akshaya Patra Foundation Madhu Pandit Dasa announced that ISKCON had planned to set up free residential schools that will be called National Talent School across the country. “We aim to provide education to more than 50,000 students from marginalised communities and we are coming up with a proposal soon,” he said. PWD and Mysuru District In-charge Minister Dr. H.C. Mahadevappa, member of Mysore royal family Pramoda Devi Wadiyar, Mysuru Palace Board Deputy Director T.S. Subramanya, MLA M.K. Somashekar, Mayor M.J. Ravikumar, ISKCON Hubballi President Rajiv Lochan Das, President of Hare Krishna Movement (Chennai) Stoka Krishna Dasa and ISKCON Mysuru President Jai Chaitanya Dasa were present. After the foundation laying ceremony, a music programme “Krishnanjali” was held where Vijay Yesudas, son of legendary singer K.J. Yesudas rendered devotional songs.